A mob of Lloyd Doblers takes to Times Square for "Say Anything"'s 20th. TRENCH WARFARE: Grab your trench coat and your boombox (extra credit for a tape deck) and join an army of Lloyd Doblers on the bleachers in Times Square to form The Mobler (geddit? 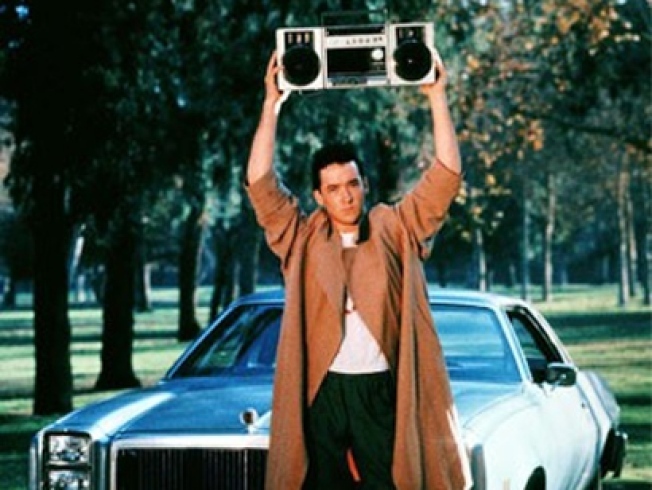 Dobler + mob = Mobler) in celebration of the 20th anniversary of Cameron Crowe’s 1989 classic “Say Anything”. Ladies, come by to play Ione Skye if you dare. The first 75 Lloyds on-scene will score a copy of the film on Blu-Ray (which makes 1989 seem a very long time ago indeed). 4-5PM. FREE STYLE: Tonight, cutting-edge jazz radio station WBGO celebrates 30 years of cramming the tri-state airwaves with rare goodness at Lincoln Center’s Rose Theater. NBC news anchor Lester Holt MCs the Champions of Jazz Benefit, a night of jazz in all its forms, with the likes of the Clayton-Hamilton Jazz Orchestra, Stefon Harris, Ernie Andrews and Paquito D’Rivera – who’ll receive a special honor -- packing the bill. 8PM. SING SING: If you’re deep in the tank for “Glee”, you may want to elbow your way to the front of the line as castmembers from the hit show do a special, intimate performance for the release of (and sign your copy of) the soundtrack “Glee: The Music, Volume 1” – out today -- at Borders Columbus Circle. If only Jane Lynch were on hand to bark orders and furrow her brow. 5:30PM.